Quantum physics can be a good point of departure for speaking about freedom, destiny and God. That is what university teachers and students from 9 countries thought when they gathered together in London to investigate how randomness, intelligence and evolution shapes nature. Science does not only make life easier, it can also help us to understand more about ourselves as human beings. But this requires that any progress in science be accompanied by a humanist and anthropological reflection. In order to achieve this global view a number of university associations have been meeting yearly for nearly fifteen years to discuss the meaning of new discoveries in the different branches of science, sharing their knowledge and their opinions. 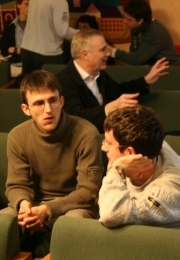 The “International Interdisciplinary Seminar” for 2007 recently took place in London, gathering together engineers, biologists, physicists, mathematicians, philosophers and lawyers, from different universities. Its theme was entitled: “Does God play dice? Evolution, Randomness and Intelligence in Nature”. We interviewed Antoine Suarez and Lorenzo de Vittori (from the Centre of Quantum Philosophy in Zürich), who were at the meeting, which took place in Netherhall House (London), a university residence and corporate work of Opus Dei. The title refers to a famous statement Einstein made against quantum physics. This branch of physics maintains that physical phenomena cannot be explained entirely in a deterministic way, through material and observable causes. Einstein, who favoured determinism, exclaimed: “God does not play dice”. But if the world functioned in a deterministic way, there would be no room for freedom! This polemic continues to be a current issue. Students of mathematics, engineers, biologists, physicists, philosophers… What brings them together? It is the concept of freedom that has formed the link between these interdisciplinary seminars for university members since they began in 1992. The aim of these discussions is to promote a scientific-philosophical reflection based on the results obtained from experimental sciences and mathematics, in order to present a world view in which freedom is possible. What is the background of those who took part? The 60 students, research workers and lecturers who attended came from 9 different countries: Great Britain, Ireland, Holland, Italy, Switzerland, Croatia, France, Canada and Taiwan. There could have been more, but for the moment we have limited accommodation. The average age of the participants was 25. One of the aims of this activity is to stimulate communication between the different disciplines. 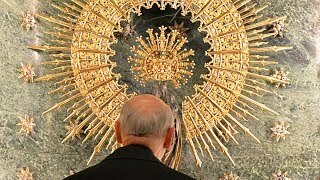 This seems to have been achieved because there were representatives from most of the scientific subjects: physics, mathematics, engineering, biology, medicine, statistics, computer science; as well as philosophy, jurisprudence, political science, and even art. What were the main discussions? The discussions revolved around the philosophical consequences that follow from a mathematical analysis of quantum physics, the tension between evolution and creation, the importance of quantum randomness for upholding freedom, the relation between a spiritual soul and the brain, and the definition of death. Which proposals were considered to be more original? A first original conclusion was the possibility of harmonising the philosophical perspective of Thomas Aquinas with recent experiments in quantum physics. These experiments were presented by the groups from Zurich (Lorenzo De Vittori, Andreas Schwaab) and Zagreb (Vuko Brigljevic and Roko Plestina). They reveal the existence of phenomena whose origin or cause is outside space and time, and therefore immaterial. The also allow for a bringing up to date of the Thomistic concept of the soul as the form of the body. The energy required for the spontaneous movements of our bodies plays the role of material cause, the soul, on the other hand, operates as the formal cause at the level of choice (whether to go left or right). Juleon Schins (Delft) has coined the phrase ‘quantum hylemorphism’. We have tried to apply this explanation to define death and it seems to work quite well. Cesare Stefanini and Federico Favali (Pisa) offered stimulating reflections by comparing human creativity with the potential autonomy of robots. But a lot has still to be done on the relation between soul and brain. Another interesting result was the “positive” view of randomness proposed by the groups from Utrecht (Alfred Driessen, Daan van Schalkwijk) and Zürich. There would not be such a thing as “blind” chance, but it would be the result of an intelligent and free cause; it could be seen as the play God permits in the “mechanism” of the world so that it is not entirely rigid and permits free corporal movements, such as the movement of my fingers on the keyboard while I write the answers to these questions. In a way, chance can be compared to the “unformed earth” or first matter which, according to the Bible, God created at the beginning. This approach sheds light on the theory of evolution in an interesting way. It has certainly been very present in our discussions. Referring to the current debate between evolution and intelligent design, Mark Fox (Sheffield), Leslie Tomory (Toronto), Jimmy Bakker (Dublin) and Andrea Manazza (Turin) insisted that there was no conflict between Creation and a scientific theory of evolution. 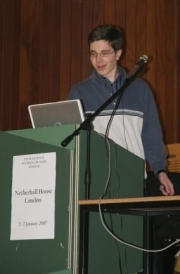 Jean-David Ponci (Lausanne) stressed that if randomness in evolution is not understood in the sense of quantum randomness, the theory of evolution would be deterministic and exclude the possibility of freedom. The economists Ed Tredger (London) and Jan Everhard Renaud (Amsterdam) analysed the concept of randomness, while the physicist Peter Adams (London) pointed out that if God is not easily revealed by science it is because the description of the world that quantitative science can provide cannot be complete, and has to remain open to non quantifiable principles. It was also very interesting to hear the mathematical angle presented by the Italian (Max Berti, Rocco Tarchini) and Zürich groups: the fundamental mathematical theorems (Gödel, Turing) show that human reason cannot be reduced to a purely mechanical process of calculation, and therefore, in that sense, it is not material. Again it would seem that no human mind can contain the whole mathematical truth. If, as Kant says, mathematics is something “a priori” and mental, not derived from sense experience, one must conclude that it has its origin in an omniscient mind which is far superior to the powers of human reason. Ironically, the concept Kant had of mathematics in his Critique of Pure Reason seemed to imply the existence of God. You say that the participants were “young” and “scientists”. These are precisely those who are generally understood to be less interested in God and in anything spiritual. Science is concerned with understanding the world, describing it as far as it can and explaining the role man plays in it – which must always be at the centre – in this context. And these scientists are fortunately ever more numerous. After several centuries in which the sciences have been studied as “separate compartments”, it now seems that the young generations wish to find a unity that is beyond their specialisation. This growing tendency is noticeable in the number of virtual discussions that are taking place on the Internet. Most of them are carried out on the blogs that are widespread among young scientists. You only need to enter “Existence of God” or “quantum physics and freedom” in Google and you will find thousands and thousands of pages on these questions. But is not only the young who are concerned with these metaphysical questions, they are also frequently mentioned by lecturers and research workers. A century ago, it was unthinkable that there should be any doubt about determinism (suffice it to recall Einstein’s reaction: “God does not play dice”). However, now, it often appears as a way to prove that there is no contradiction between science and religion. Nowadays it is an accepted position, no doubt criticised, but constantly up for debate. It is pleasing to notice how the great specialists in quantum physics hold that in the world there is room for freedom and for God. But is it not against the current trend to open up this debate? Yes, it certainly does go against those who are accustomed to see the world in a “determinist” light. However, this new position is no longer rejected; it is listened to with interest. The great thing is that the current of scientific thought no longer goes in one direction. The river now is full of whirlpools, and that is the best way in which science can progress. I understand that you have continued the debate in a blog. Yes, whoever is interested can see the presentations there and can take part in the debate: www.scienceandbeyond.net What was the general atmosphere of the congress? Very stimulating; it can perhaps be best illustrated by what happened at the end of the last session: The moderator, to sum up, asked, “Does God play dice, or not?” And the audience answered: “Yes, He does. And He enjoys it”. Perhaps this is another way of explaining the “ludens in orbe terrarum” of Proverbs 8:31. 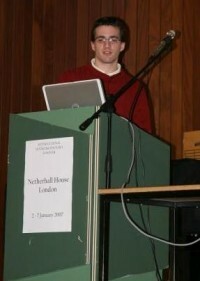 The next Seminar will take place in London on 2-6 January 2008. The theme will be: “Is there any room for the soul in neuroscience?” We will be debating the neurophysiological basis for personal identity and free will. Official webpage of the Seminar: "Evolution, Randomness and Intelligence in Nature". Blog of the participants in the Interdisciplinary Seminar.